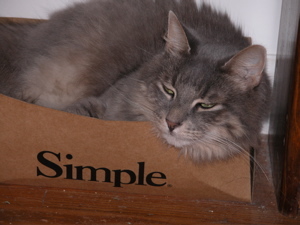 If you’re a cat, happiness is the right size box… just small enough that you can fill it. Make sure you pick a box that lets you rest your head on the edge. You might miss something. If you’re a knitter, happiness is a lot of yarn (cats like yarn too, come to think of it). And if you’re a writer, happiness is having a lot of yarns, or stories, to tell. This is where I write about non-work stuff. Look here for stories about what makes life richer: family, cats, knitting, art, and hopefully, creative language play. Happiness shouldn’t be complicated.